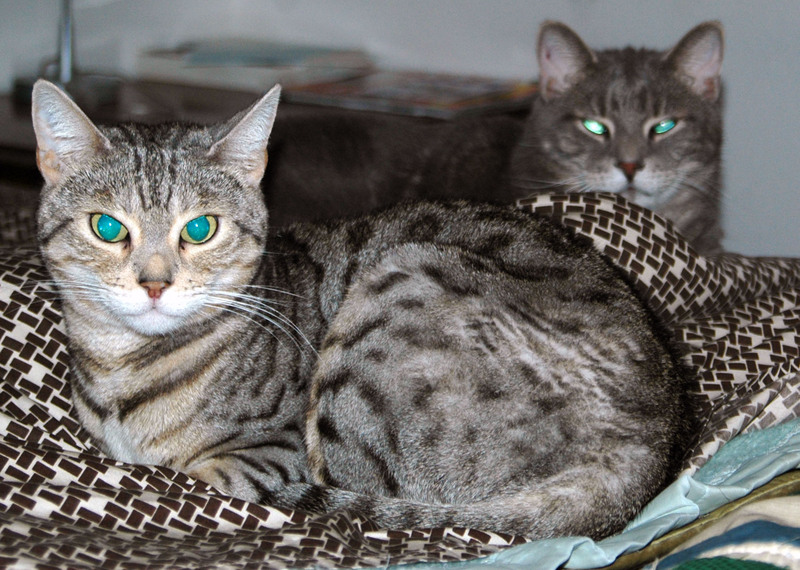 Bagheera the Diabetic Cat — Page 522 of 523 — I am a bengal cat who was born in 2005. In the summer of 2012, I was diagnosed as a diabetic cat. I want everyone to know that diabetic cats like me are just as fun and loving as cats without the disease. My human has been doing yoga for years. And while he’s getting better, he just isn’t as flexible as I am. And I don’t even practice three times a week like he d oes. I just do my thing and I am much more flexible. Other humans say that my human is a pretty good one. He may be a good human, but he’s not very good at being a cat. His cat pose is nothing like what Jacey and I do and he’s been practicing it for so long. It’s so cute, though, that he wants to imitate us even if the pose isn’t like us at all. Some of us felines love to have tummy rubs done by certain humans. But there are lot of us who will show you our bellies, but we really don’t want to be touched there. And if you’re a human who picks the wrong cat to do that to, you may find out w hy we are such great hunters. Our claws do rip skin and flesh efficiently although we normally don’t do it to humans we love. I let my human give me a tummy rub, but he and I play rough with each other. I will give him play bites, and since I know he is not going to hurt me, I will let him rub my stomach. Jacey lets him do that, too. What about your cats? Do they let you give them tummy rubs? Today has been just a lazy Sunday. Jacey and I spent the day relaxing on the balcony, soaking up the Southern California sun. Then we went over to our human’s bed and decided to lay down on it. So much for him getting to use it, ha ha ha! My blood sugars were okay. Last night, it was 238. This morning, it came in at 296. So both of those are below that bad 300 number, even though the morning’s number was higher than we like. I got five units of Levemir both last night and this morning. We will see how my blood sugar is tonight, but we haven’t really had any real bad spikes or crashes. So while it’s still fluctuating, and still higher than we’d like, it’s at a level where we can live with it.